Former Hailey resident Preston Smith, 30, got a serious brush with fame two weeks ago at the inauguration of President Barrack Obama in Washington, D.C. It began three weeks before when a fellow painter had to drop a commission to paint Obama for the Inaugural Purple Ball. In something of a panic and with time running short, the ball's marketing director, Foad Ashari, took a look at Smith's work and handed over the commission. Smith, who has lived in Los Angeles for more than six years, is the son of Marshall and Karen Smith of Hailey. A 1997 graduate of Wood River High School, his art teacher was John Blackman, the current principal of the school. "I had to do 12 paintings in three weeks, and I work part-time at a restaurant," he said, amazed at his own abilities. The paintings were gifts for the Purple Ball's producers and its host board—Patricia Arquette, Amy Brenneman, Ed Harris, Ashley Judd, Josh Lucas, Amy Madigan, Brad Silberling, Kate Walsh. Each painting of Obama is the same but with slight differences. As he painted the background on one, another would be drying in front of a fan. "They had to be dry to ship, so I had to schedule the rotation," he said. "For three weeks, I'd get up paint, work, go home, paint. It showed me what I can do if I put my mind to it." But the best was yet to come. After shipping off the paintings, he jumped on a plane and followed them to D.C.
"I was there for two days, stayed with my roommate and his brother outside of D.C.," he said. "Traffic was insane. There were four million people and people were lined up at 4 a.m. for the Metro into town. "We were packed in like sardines. It was crazy, really great. There was such a good vibe in the air." The Purple Inaugural Ball took place at the Fairmont Hotel with all the champagne, music and glitz one would expect. "I saw Amy Madigan and Ed Harris, who is one of the idols," he said. "'Pollack' is my favorite movie. I've wanted to meet him. I also met Amy Brennaman and Ashley Judd. It was really cool at the event. I sat at the VIP table, which was fun. Il Divo started to play 'Hallelujah,' a Jeff Buckley song, and they brought the paintings out. George Lucas shook my hand and pulled me down to talk for awhile." After a quick two days, Smith returned home to work with a boosted résumé. 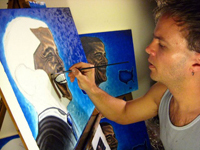 He has been in some 15 shows in and around Los Angeles and was featured at Colachi Arts in Colorado Springs.